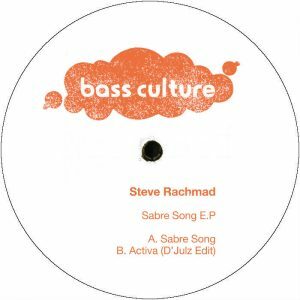 Bass Culture welcomes another industry heavyweight to its roster of talent with this new release, which follows hot on the heels of the killer 50th release by Mr. G. This latest release comes from long time friend of Bass Culture owner D’Julz and Dutch techno hero Steve Rachmad. Steve is renowned for his funky take on techno, honing his skills as a DJ and producer over 25 years and establishing himself as a respected and hugely talented artist in the process. The first of two tracks on this new EP is entitled ‘Sabre Song’ – a stomping, illuminating cut straight out of the Rachmad school of Detroit-influenced techno. D’Julz heard Steve play the track at Womb in Tokyo and had to sign it on the spot. ‘Sabre Song’ is a perfect fit for Bass Culture with its groovy bassline, cutting hats and ‘big band’ instrumentation. On the flip D’Julz himself contributes an edit of one of Steve’s nineties classic, a favourite of his and one which both men agreed should be given a release. Pumping out at a speedy tempo, the force is strong with ‘Activa’, transporting us back to the rave era with its catchy melody, and retro physique. Summer vibes all the way with this one. This entry was posted on June 9, 2016 at 10:16 and is filed under Release.